Mexico is boo-hooing about their water, insects, and pollen not being able to cross the border freely if a fence is built. Wish they cared half as much about cracking down on the ridiculous amount of illegal drugs being exported out of their country. MEXICO CITY (AP) — Mexico called on the United States to alter a plan to expand border fences designed to stem illegal immigration, saying the barriers would threaten migratory species accustomed to roaming freely across the frontier. This is ludacris! They are really grasping for straws. The more I read this, the funnier it gets. I’m a tree-hugger and will, at every opportunity, do what I can along with others to actively protect the environment and conserve resources. The border has to be sealed, that’s of vital importance to the future of America and ALL her citizens (even if millions aren’t yet able to see the forest for the trees), but if it can be done while also providing protection for the environment and other life forms that live on Earth, then it should be done. If you’re a staunch supporter of limiting immigration, then you should also be a staunch supporter of our environment and resources. You won’t like what is left after overpopulation begins to dramatically affect ALL our lives. And if ANYONE cares about what the UN has to say about it, then THOSE are the people we should all take issue with. That’ll be the day when we allow anyone NOT an American to influence what we do with our self-sovereignty. They will use environmental reviews and feedback from the local community groups as a way to slow progress on the fence as long as possible. The only way to speed up the process is activism. What a mess. There must be organized groups "out there" that have formed up and that have one-click letter-writing capabilities at their websites to deluge representatives at all levels with citizen opinions. Know of any? I am led to suspect that the Mexican government is far more interested in keeping the US border open to provide easy access for the millions of unskilled poor people they are so fond of encouraging to violate US immigration law and settle in El Norte. And the Mexican gov. is talking to us about pollen?? bs...there are LEGAL ways for these species to enter this country! I've got absolutley no problem with any migratory species entering the US so long as they do so legally...and pay taxes like our species do! Ha! That one cracked me up. I agree. The more poor they chase out of the country, the better off the remainder will be. And the more of them are in America and the higher the birth rate, the easier it will be to create Canamexico. I wonder if the-pie-sliced-into-fewer-pieces-makes-for-bigger-pieces concept will ever catch on in America. Nah. Better to keep bringing in more people to cut more pieces out of the pie. Hasn’t Mexico City been rated the most polluted city on Planet Earth many times? My recollection might be incorrect, but I do recall something along those lines. “Mexico’s Environment Department”—indeed! If only I had the talents of a cartoonist; I have some ideas of how to show what a joke that department must be. 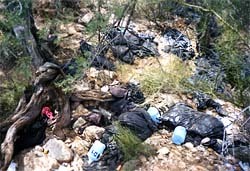 If the so-called government of Mexico is genuinely concerned with the degradation of the environment, then said government should be supplying trash cans. But then they’d have to admit complicity in the exodus.